Usually I’m at least a year behind on these things (I read the Hunger Games trilogy maybe two months before the movies came out; I read Gone Girl about six months prior). When I saw this in a book shop while on vacation I mentioned to my husband that I thought it had been reviewed a bunch this year, and was the subject of a book club, but that I knew nothing about it. I feel lucky to have come into it without any realy background information, because I didn’t know what to expect. I loved this book. I’m currently in Paris, and have a really nasty cold, so we’ve been alternating between exploring the city and then coming back to the hotel to rest. During those hours when I did’t feel well enough to wander, I read this book. It was captivating, it was interesting, and it is a book I’d recommend. As someone who works on emergency management planning, the basics of the pandemic (although we didn’t get tons of details ) were really interesting to me. I’ve got another book to read soon – “The Knowledge: How to Rebuild our World from Scratch” – but I wonder how long it really would take for certain things – for example, electricity – to return to this world. It’s not my favorite book ever (or even of this CBR), but it’s so very good. What I think is interesting is that, for me, I didn’t get absorbed into the world. I was always aware of the fact that I was reading a book, and even though the descriptions Ms. St. John Mandel are vivid, I am left feeling as though I both can and cannot picture any of the main characters. That might not make sense to anyone not inside my head, but usually when I read what I consider well-written literature, it feels like a film is playing in my mind. I didn’t ever get that from this book, or I should say, I only got it on occasion. It’s unclear whether that is me or the book, but it’s what keeps it from a five star rating. As for the book club discussion, I think who people think is the main character is an interesting one. For me, I didn’t think there was really any question that Kirsten was the main character. I thought that was obvious, so it’s really interesting to read other folks who think that clearly Clark, or any of the other characters, was the main character. 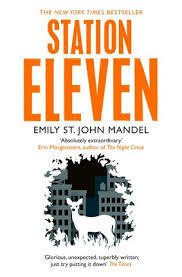 I do love that and think it speaks to the author’s ability to create a world that speaks to readers in different ways. I read this 200-page book in a day, after finding it while browsing at a book store in London. It looked interesting; it was stories by a psychoanalyst, talking about cases and what we can learn from these patients. The stories are sometimes interesting, but mostly kind of boring. I’m not familiar enough with psychoanalysis to full get what they do (do they just keep asking questions until their patient comes up with answers? ), but I’m not a big fan of how this one writes. The stories are told, and then … they end. Abruptly. With no discussion about what they really mean for the patient, or even why the author felt the need to include them in a book. That makes sense to a degree, I suppose, but honestly I can read stories about anyone anywhere and try analyze them; I was expecting more from this book. I get the sense that the author is trying to be poignant at times, trying to get us to really understand ourselves and learn from these patients. He even ‘helpfully’ categorizes these stories into broad topics. But really, I didn’t get much out of this book beyond a couple of interesting stories, a couple of really boring stories, and a bunch of meh stories. Sophronia and her friends are getting ready to head back to her hometown for her brother’s engagement masquerade ball (ah, yes. the traditional engagement masquerade – the husband and I really missed out). Their good friend, who is part of a werewolf pack (although not a werewolf herself), is distraught and leaves their dirigible school when she gets bad news. From there, things get even odder. Steampunk is a fairly new genre for me, but I get its appeal, and I enjoy these somewhat quick reads. Things can’t be solved with a quick text message or crowdsourced post on social media – people have to really work to puzzle things out. It’s refreshing. Plus, it’s fun to picture these worlds where everyone is dressed really nicely and worries about manners. I wouldn’t want to actually live in that time (apparently some members of the conservative party in Ms. Carriger’s universe are just as racist as some of the politicians in our universe), or in a world with vampires and werewolves, but it can be fun to visit. Slight side note – can people who are creating new world consider creating ones where being gay isn’t a thing that people find ‘shocking?’ Or find to be a bad thing? There’s so much creativity in this book that it’s disappointing that sexuality – and conservative views of it – seem to have been transplanted directly from our universe to theirs. 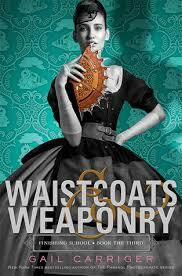 Regardless, if you like steampunk and YA, I think you’ll probably enjoy this book. I don’t think that I’ve laughed out loud at a book that wasn’t a straight up comedy memoir in a long time. 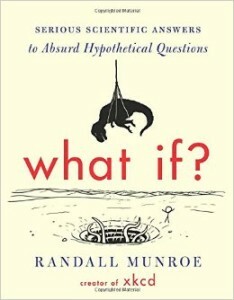 Randall Munroe is the cartoonist behind xkcd. In this book, he takes on some pretty awesome questions that are utterly ridiculous (but still fun to think about) and sorts out the science. The tone kind of reminded me of my favorite fiction book this year, “The Martian.” There are a lot of calculations that I don’t fully understand, but he explains them well and with loads of humor. Each response include some hilarious footnotes (seriously, there’s one that’s a somewhat obscure reference to the TV show Friends) and lots of his great cartoons. A sample question (and one of my favorites, because it involves maps) is ‘which US state is actually flown over the most?’ To answer this, Mr. Munroe looked at 10,000 flights and determined a state was flown over if a flight did not take off or land in the state, but crossed the state’s airspace. He also, for a little extra fun, calculated which airport is responsible for the most flights that cross that state. The answer to the question, by the way, is probably not what you’d guess it is. The editing of this book is superb; some of the best comments appear as a surprise turn after flipping the page. And the questions are mostly really interesting; only a couple responses did I feel like skimming. Mr. Munroe also offers up examples of some of the more disturbing questions he’s received. He doesn’t answer these, but provides sometimes hilarious cartoon responses to them. I read this book over a couple of days while travelling and think it’s mostly perfect as a travelling book. Each question only takes up three-five pages (and probably 20% of that is cartoon), so you can pick it up for ten minutes at a time. Really the only drawback for reading a physical version (as opposed to the ebook) is that it is currently in hardback and a slightly odd size – the height seems to match most hardcovers, but it is a bit wider. If you travel with a partner, I suggest bringing it as once you finish it your partner can pick it up and will likely enjoy it. This is going to be quick. We decided last fall to do another visit to London and Paris in the spring. I wantedto see my friends, and we both loved Paris when we were last there. We’re now in Paris, having spent four nights in London. One thing that was a reminder for me is that trips to London aren’t really vacations for either of us. For me, they are reunions, full of wanting to see my friends as much as possible. For Austin, it’s a lot of going where I want to do. He likes my friends a lot, but it is more socializing than either of us usually do, and in a condensed time. Which is why we go to London first. We see friends, get ourselves exhausted, and then can relax on the next leg of our trip. We took the train down this morning, and were greeting by a hail storm. It was actually kind of cool. Our hotel here is LOVELY. Hotel Banke. Check it out. Don’t know what deal we got online, considering how expensive the drinks in the bar are. But the room (we’re on the top floor!) is sweet – not as small as I expected, and with a gorgeous view. After freshening up we decided to seize the sun that had burst from the giant rainclouds and went on a 5 and a quarter mile tour of the city in about three hours. Based on a recommendation from the front desk, we had a very French meal – at a large restaurant that has been open for almost 150 years. They were very kind (they had menus in English as well as French), and my steak and frites was delicious. The only real downside right now is that I have a cold. It’s not nearly as bad as some other colds, but it’s not fun, and I’d rather just be able to keep going without having to stop to take medicine, or blow my nose, or rest. But considering I’m in Paris with the best man I know, I’m still pretty lucky. Oh, and I’ve already had macarons. So yeah, this trip is awesome. This one has been on my to-read list basically since it came out. I knew I admired her for her stance on education (and her willingness to be so vocal at such a young age), but I didn’t know much about her beyond that, or much about her home. This is a really interesting book for someone like me, who is not familiar with Pakistan, or at least not familiar with it beyond what gets reported in the U.S. media. If you look up images of Swat (the region of Pakistan where Ms. Yousafzai and her family come from), you will see it is utterly gorgeous. The book provides some basic history of the area, giving the reader a lot of great information about the culture, about religious influences, about the military, and the politics of the region. The book starts with a quick chapter on the assassination attempt that nearly took her life and made her even more recognizable than she was, but the vast majority of the book is about her life before the shooting. In addition to the history I mention above, she talks about her daily life, about how things changed with the Taliban, about challenges of education. Her father is a really interesting person, as is her mother; I loved reading about them as well as Ms. Yousafzai. The book itself is told in Ms. Yousafzai’s voice, with some assistance from Ms. Lamb. I don’t know if it was written in Pashto and then translated, or written directly in English (she is fluent in those languages, as well as Urdu), but it definitely does feel like something written by a young woman. The language is at times very flowery and the sentences can seem short and simple, but they paint a very vivid picture. I can clearly pull up in my mind her home, her school and her town; she is an excellent storyteller. 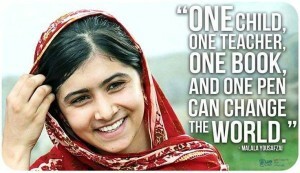 You probably heard that she was awarded the Nobel Peace Prize last year; her work is pretty amazing. If you want to learn more (but don’t plan on picking up the book just now), you can visit the Malala Fund website. This is a dense book, but it’s easy to read. 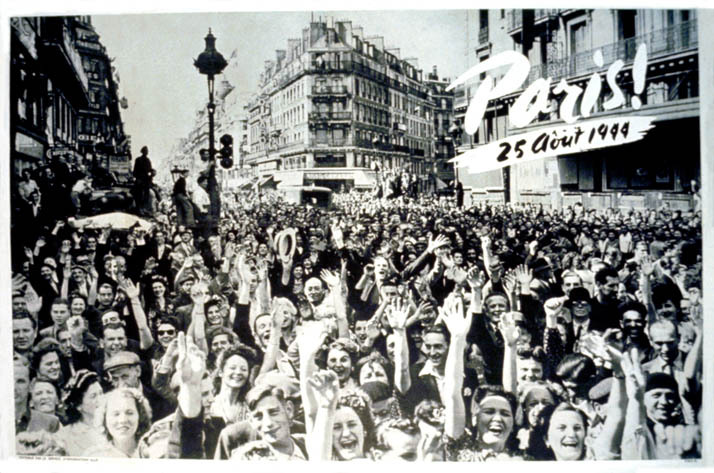 It’s an almost 400-page look at the four years when the Nazis occupied Paris. 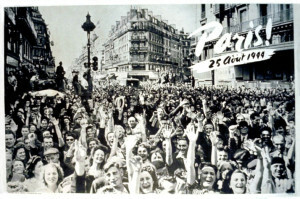 As someone raised in the U.S., I’ve heard jokes about how quickly the French surrendered during World War II, and how the U.S. liberated them. But that seemed a bit simplistic, so when I saw this in a book store I knew I wanted to read it. Mr. Rosbottom has done a ton of research and created a really interesting story. Even though there is no, say, central narrative (i.e. there is no one family we follow from start to finish, which some writers of history do, such as Erik Larson did with “In the Garden of Beasts,” which I read earlier this year), each chapter follows the previous in a logical manner, and is still filled with stories that help us understand what life was like. He spends time talking through how very quickly the French did come to an agreement with the Nazis about how France would be governed. Ultimately this probably saved Paris from being destroyed in bombing campaigns. He follows that up with how the Nazis were greeted and interacted with Parisians during the first year, and how that slowly changed. There were eventually curfews, and rations. Jewish people (especially foreign-born Jewish people) were rounded up and send off to prisons and concentration camps. And this is where the most interesting discussions come up. How much should the French people – not the military, but the people – have fought back? By not engaging in a resistance movement, were they essentially accepting the Nazis? Were they cowards, or were they people who recognized that they didn’t have much they could do? Should we blame those who, say, served Nazi soldiers, even though the acts of resistance some carried out resulted in many deaths of French people? Do we blame people for doing what they think they need to do to survive? This is clearly a sore spot in French history. Immediately after the liberation, those who were considered to be ‘collaborators’ were treated horribly – and many of those were women, who were taken in the street, had their heads shaved, and paraded around for sleeping with Nazis. Some people were accused of things they didn’t do and were killed by mobs. And some, like members of the French Police, helped bring in people to be sent out of the country and ultimately killed. How much responsibility should they bear when acting under an Occupation? These are bigger discussions than can be resolved in one book, but if Paris interests you, if World War II interests you, and if philosophical discussions interest you, I’d suggest this book.